PRINCE KUNTA-KINTE'S BLOG. : # IGBERE HISTORY AND ORIGIN ( FACTS AND FALLACIES) BY ELDER, DR. UWAKWE O.A ESSE. # IGBERE HISTORY AND ORIGIN ( FACTS AND FALLACIES) BY ELDER, DR. UWAKWE O.A ESSE. A. WHERE IS IGBERE LOCATED ? !!! The first question that will enter the minds of our friends who are not indigenes of igbere will be; where is igbere? Who are these igbereans? These are the questions this lecture is going to answer. Before we go into the main subject of this physiographic of igbere. Igbere is situated northeast of umuahia, the Abia state capital city. It is located at latitude 50/41-N and longitude 7/44-E. It is interested to know that there is a village in south of Abakaliki called igbere on latitude 6/2-N and longitude 80/2-E. igbere’s closest neighbors are (ABIRIBA ON THE EAST, ITEM ON THE NORTH, ALAYI ON THE WEST, AND OZUITEM AND UMUHU AS THE SOUTH). IGBERE covers an area of 40 square miles with a population of about 2,000000 (two million ) persons according to last national census. Igbere can be described as a town perched on top of a hill because of hilly nature of the area. The prominent and popular among the hills are ( MGBELE IBINA WITH WHITE SAND, MGBELE COURT….UGU-KOT BEFORE IGBERE HEALTH CENTRE, AND MGBELE OKAFIA). Igbere most popular rivers are ( IGWU-RIVER IN OKAFIA AND MBUBA RIVER IN AMANKALU). In 1925, the mbuba river was traversed from its source to its confluence with the igwu river by Europeans explorers. The first time a white man touched foot on igbere soil was in UMUIKPO OKAFIA IGBERE in 1903. The people’s environment has greatly influenced the social, cultural, economic and political life. Igbere people are well built, and they have great capacity for work and considerable ability. They are very hospitable and peace-loving people. The splitting of the town into 13 Autonomous communities by (GOVERNOR, CHIEF, ORJI UZOR KALU…OUK) in 1998 following the communal war erupted through the demise of (LATE EZE SAMPSON UKAEGBU….EBIRI 11) who was assassinated by unknown persons. The creation of these communities has not diminished the legendary unity among the people. They have continued to live together as UMU EBIRI. ( IGBERE WELFARE UNION) still act as the binding cord which nobody can break. In terms of modernity, igbere has metamorphosed from a rural village/ community to one of the urban cities in Abia state. Igbere is linked with good motorable roads to other major towns in Abia state. Igbere had produced 3 state governors, 2 vice chancellors, big time entrepreneurs, international footballers, great entertainers, 2 SANS, sea of lawyers, uncountable medical doctors, and captains of industries in business and oil & gas. Numerous lecturers & professors. Every family in igbere has raised 3 to 4 graduates. The town is not lacking behind in any sphere of human activities. Igbere has lost its virginity as a typical Nigerian village as it is now a world class tourist center consumed with rampaging modernity. The town is dotted with Architectural master pieces of world class hotels with modern state of arts equipments. Apart from the EZUMEZU, the mother of all cultural festivals in igbere, we have other events that ignites fire in igbere during yuletide….xmas such as…. ( THE FACE OF IGBERE BEAUTY PAGEANT ..FOI, MISS-IGBERE BEAUTY PAGEANT, IGBERE ULTIMATE SEARCH, AMADI IKWECHE MEROMIAL LECTURE, IGBERE FOOTBALL COMPETETION, IGBERE UNITY CARNIVAL, CANTATA PRAISE CONCERT, IYIAMAUKWU TOURIST CENTER AND IGWU-IGBERE RIVER IN OKAFIA.What so ever you want, is in igbere….the land of peace and hospitality. There are many theories surrounding the origin of igbere ancestors. There are some who believed that igbere belong to the lost tribe of Israel.this is the first fallacy in the history of igbere origin, the claim of igbo origin was already been dismissed by scholars as a vain search for a noble cultural ancestry. The second fallacy is the autochthony theory propounded by those who say that God created the igbere ancestor at EKE igbere. Now, the third fallacy is that some said in their amateur history of igbere that igbere ancestors emerged from God’s human factory at OKAI EKE is unhistorical. The creationists believe that God created their ancestral father OKOMOKO at EKE IGBERE, which they still revere as the most sacred homeland. Elder, ojukwu igu stated that ( igbere people have no other place of origin except the eke igbere. This view is also corroborated by the accounts provided by elder, uche ibeka and kalu uko. They stated that in the remote past, igbere ancestors ( our fathers told us lived at eke igbere since God created the world) these people believed that eke igbere was the original home of man. All these are fallacy, igbere ancestors were not a direct product from God’s creative factory as others said, and rather they belong to a specialized human group. The creation story is a fallacy. There are those who agree that igbere ancestors belonged to a specialized pre-existing pool of human beings and cultures. In this regard references are made to places as (ANDONI, OKOMOKO, OGONI, ISIOKPO AND ISRAEL) migration from Israel has been dismissed by schorlars as a vain search. Equally migration from andoni is a pure fallacy, in spite of the assertion by some writers that (THE TRACE OF EBIRI OKOMOKO TO ANDONI IS A HISTORICAL TRUTH) but late IGWE ANAGA from okafia has traced the origin of igbere ancestors to OGONI, while ABEL UCHE AGU TRACED THEIR ORIGIN TO ISIOKPO. These are igbo speaking communities founded by some igbo groups during the igbo migration from the OWERRI AXIS towards the coast. Okomoko was one of such igbo communities founded during the period. They are all in the present Rivers State of today. Unfortunately, igbo further movement towards the coast of the Atlantic Ocean was halted by the IJO-NORTHWARD expansion from the central ijo area. When the igbo migrants and the ijo expansionists met, there was fighting which (ELDER, ABEL UCHE AGU) described as (AGHA-IGBO). The war which lasted for a long time, forced some families to leave their original home in isiokpo and okomoko to migrate northeast across the imo-River through the Ngwa territory into the present Umuahia area already occupied by the IBEKU ANCESTORS, igbere ancestors were among the families that left okomoko in search of a safer area to settle. Generally, igbere people believe strongly that okomoko was the ancestral father of the igbere people. Some say that he was the father of EBIRI, whom they regard as the real founder of igbere. According to (elder, ojukwu igu) okomoko was the man created by God at EKE IGBERE. But C.A.L. GUISE, in his intelligence report on igbere in 1934 referred to okomoko as (THE COMMON ANCESTOR OF THE CLAN) but no one was able to state whence he had come from. (ELDER, ROWLAND EKEOMA ABARA) seems to have changed his views about okomoko. He now believes that okomoko was neither the ancestral father of the igbere people nor the real founder of igbere. The long controversy surrounding okomoko can be attributed to lack of knowledge. Because where knowledge is lacking, speculation flourishes, while myth, legend, and conjecture take the place of the true knowledge. The facts of history are always buried in a haze of legends. Thus by a process of stereotyping the name okomoko has been so reduced that the same name has to do for an ancestral father and for an ancestral home. OKOMOKO IS NOT THE ANCESTRAL FATHER OF THE IGBERE PEOPLE, RATHERIT REFERS TO THEIR ORIGINAL ANCESTRAL HOME NOW LOCATED IN THE PRESENT RIVERS STATE. Okomoko is an igbo-speaking community located in the south of OWERRI in the present ETCHE LOCAL GOVERNMENT AREA. It is bounded on the north by owerri and on the east by IMO RIVER. Igbere, we can now say with some degree of certainty that okomoko is the mime of a place, and not the common ancestor of the clan. Madam PEACE IGWE and elder ADIELE CHUKWU claim that it was Ebiri’s children who founded the CONSTITUENT IGBERE 13 VILLAGES. All these stories are fallacy, misinformation, and lack of knowledge on igbere history. According to (ELDER, OGWO KALU OGWO) from amaiyi community, he said that ( EBIRI FORMED PART OF THE EARLIEST IMMIGRANTS INTO THE EASTERN PART OF NIGERIA). Mr. Mang Obasi sees igbere as one of the Cross River-igbo communities and is often referred to as Ebiri, while Agboji Village in Abiriba is also referred to as Agboji Ebiri. His claim that Ebiri is of Ekoi origin is speculative and suspicious. The Ebiri tribes were among the vanguards that moved from the igbo heartland to the orlu Axis southwards towards the coast. As they had already settled at okomoko as Ebiri people before the igbo-ijo war erupted. It was this war that forced them out of okomoko. These Ebiri group of people were never submerged, suppressed or assimilated by any other group during the olden day war. They always retained their identity as EBIRI PEOPLE, even when they were subjected to series of attacks by some adventurers. When the Ebiri people, the igbere ancestors left okomoko, they followed the same route created by earlier migrants. They passed through ( ISIEKE AND AJATA IBEKU VILLAGES) until they arrived OHAFIA where some of the Ebiri group settled down, while majority of them moved northwest of OHAFIA. They settled at a place situated between ( NGUZU EDDA AND ABIRIBA) which they called (OKAI ORONYI).There were migrants from the ARO DISTRICTS who settled in this area who founded the (AFIKPO, EDDA, AMASIRI AND UNWANA COMMUNITIES) the aro-ibibio war in the 17th century led to mass exodus of families, adventurers and warriors in search of land to settle. One of the adventurers whose action helped to shape the future history of the Ebiri ancestors was a warrior called (IGBO UKWU) the adventurers of igbo-ukwu are recorded by ( H.WADDINGTON….DISTRICT OFFICER) for afikpo in 1931. According to Waddington, he was the son of OHIFENTA AND THE FOUNDER OF AFIKPO. He described him as a warrior and adventurer, who led an expedition out of ibom village in arochukwu to explore the land and to find a habitation elsewhere. In his company were (OTA AJA AND OBENE UKWU EZE). Igbo ukwu and ota Aja were not Aro slave raiders. Another personality whose action further influenced the history of igbere was a man called AJA IBEREKWU. He appeared on the historical arena a few years after the death of igbo-ukwu. This man came from ( UKPO NEAR OKPOSI), he was also an adventurer and a warlike person. He fought many wars with ( IMONTA OFU AND OFU IMO), and many other communities. According to ( H. WADDINGTON) he wrote that ( IN THESE WARS, HE WAS ASSISTED BY A TRIBE KNOWN AS EBIRI WHO LIVED IN THE DIRECTION OF EDDA BUT NOW EXTINCT) Aja Iberekwu sought for the assistance of ebiri because he had heard of ebiri tribe’s gallantry and invincibility and decided to hire them to assist him in his wars. The claim by Waddington that the Ebiri tribe is now extinct is far from the truth, Rather after series of attacks, the Ebiri people dispersed and scattered in many directions. Some of them settled in (AFIKPO, ABARIBA, EDDA, NKPORO, OHAFIA AND UTURU), while the majority of them became the founders of igbere of today. Igbere is the largest surviving group of the Ebiri Tribe. Outside igbere, they constitute a minority group in their new homes but have refused to be submerged or assimilated by anybody or group. They have proudly maintained their identity as members of the Ebiri family. We have said that the Ebiri tribe constituted the largest single group of igbo speaking people that lived in the Edda direction, on dispersal they went to different directions, But the igbere ancestors did not move straight to (EKE IGBERE) as some writers are wont to believe. They did not leave okai oronyi because a mighty bird carried away an Edda man. This story is the tale by the moonlight. It is unhistorical but belongs to the realm of myths and legends. We were not told what they called their new settlement. But item tradition of origin states that igbere ancestors met them at a place they called ( ABALA EGBE OR AGBALA EGBE), here they lived together. It is not clear where abaala egbe, now extinct was located. It must have been located not far from abiriba. According to Mang Obasi, igbere and item lived near Abiriba in a place now extinct before they parted ways. The inhabitants of Agba Egbe were iron workers and black smiths. The item say they moved to Agba Egbe from ( OPOTOPO) which may be a corrupt form of OKOMOKO. According to igbere and item traditions of origin, it was the dispute over kola-nuts that led to their dispersal from Agbala Egbe, which igbere tradition said took place at EKE. This event had taken place before they moved to settle at igbere. The kola-nut episode also features in the traditions of (ALAYI AND OZUITEM). MR, GUISE WROTE…the legend goes that many years ago, a dispute over kola-nut in the eke market led to the rupture of the tie of relationship.) The episode tends to confirm the fact that in the remote pact, the ancestors of (IGBERE, ITEM, ALAYI AND OZUITEM) once lived together at a place now extinct. The kola episode did not take place at EKE IGBERE. ONYIKE AGU, described by guise as the direct descendant of igbere ancestral fathers, never made reference to eke igbere as the original home of igbere ancestors. References were made to okomoko establishing the first settlement at (AMAUKWU) on the site of the present EKE MARKET. A close study of the mode of settlement in igbere tends to suggest that there were waaves of movement into igbere. There movements from the east, west and south. There was no mass movement led by one leader who could be regarded as an ancestral father. The Ebiri group who now called themselves igboeru because of their encounter with igbo ukwu now broke into small groups migrated to their present site at intervals. The ancestors (AMANKALU, IBINA, AMAUKWU, AGBO AND EZIAMA CAME IN FROM THE EAST OF ABIRIBA, WHILE THE FOUNDERS OF THE EZI-IGBERE VILLAGES ENTERED FROM THE SOUTH, THE AMANDI ANCESTORS ENTERED FROM THE WEST WITH ALAYI AS THEIR CLOSEST NEIGHBOR, UMUOKARAZU ANCESTORS ALSO ENTERED FROM THE WEST). The ancestors of AGBO AND EZIAMA villages were founded by Ebiri groups who moved from the southeast, they crossed the MBUBA RIVER to establish their settlement near the EKE FOREST. AMAUKWU Ancestors also crossed the mbuba River to establish north of AGBO AND EZIAMA. They first settled at a place now called EKE AMAUKWU. They settled very close to the Mbuba River which provides easy access to drinking water. AMANKALU AND IBINA constituted the largest group of the igboeru migrants to the present site. They entered through OZARA NKUMA, crossed the MbubaRiver before they finally settled down. The AMANKALU ANCESTORS entered first and settled very close to the river. When the IBINA ANCESTORS found amankalu already settled, they moved a few meters away and settled at a place now called IBINANTA, they settled there because it provided them with easy access to IYINTA-OBA and IYI-OMU. It was from this settlement that they disperse to form the ( IBINAUKWU, AMAOFUFE AND UMUISI VILLAGES). Those who climbed the Mgbele ibina established at IBINAUKWU, while AMAOFUFE settled at the vally in the former (EBELE MARKET AREA). As I said before, the first settlement of ibinaukwu was at the present ibinanta, it was the growth in population and lack of enough land to farm and build houses that caused some people to move in search of new areas for habitation. Demographically, amankalu has the largest population in igbere, followed by ibinaukwu. The population thins down as you move from Amankalu to agbo. There is no evidence showing that the EKE AMAUKWU SETTLEMENT said to have been founded by okomoko built up a level of population pressure which the environment could not carry or sustain and which could have forced people to move to establish the present igbere villages. There were no sons or grandsons of Ebiri or okomoko who founded these villages. Guise was told that sons of okomoko were ( NKALU, IBINA AND EZE; no mention was made of other igbere villages. This claim is a FALLACY. The origin of the name IGBERE is as controversial as the origin of the town itself. According to C.A.L. GUISE, okomoko’s unfailing optimism and sympathy earned him the nickname (IGBERE-BERE…MEANING IN THE LOCAL DIALECT, NEVER MIND OR DON’T WORRY) Thus igbere became the name by which the clan was known. The implication of this assertion is that the name igbere originated from okomoko’s nickname. In recent times the origin of the name has become a subject of acrimonious debate. It is pertinent to point out at this juncture that there is a village located at the south of (ABAKALIKI) called igbere . the relationship between the two communities is an area for further research. According to elder, ojukwu igu, the name igbere derived from ( igboeru) He claimed that it was okomoko who named his okai eke settlement igboeru because the thick forest surrounding the settlement provided him and his people adequate protection against external invasion because of its inaccessibility. Elder, igboko ude said the place was originally called igboeru because of the people’s military valour which prevented invaders from reaching their house. Among the amateur historians there is no unanimity as to the origin of the name ( igbere). Reference has already been made to oral tradition where two informants agreed that the name originated from igboeru. But there are writers who claim that the name originated from (IGBO-ERE). In another attempt to explain the origin of the name (elder, Ejie Eke Ukaegbu) stated that it was when the Aro Okigbo could not sell its people into slavery that they agreed in disgust that the place was no doubt igbo-eru as well as igbo-ere. He is of the view that it was the Aro slave raiders who originated the name. ( elder, Rowland Ekeoma) submitted that the name was derived from igbo-ere. He corroborated ukaegbu’s assertion that the name was a group name given to the people by the aro oke igbo slave raiders. They described the people as (IGBO-ERE) because they found the people the most elusive group to be captured and enslaved. The accounts by Ukaegbu and Rowland attributed the origin of the name to the Aro people whom they described as slave raiders. They believed that the aro slave raiders were led by a man they called OTA OBOM. He led the invasion to igbere. Faulting the claims of ukaegbu and Rowland, ( elder, OGWE KALU OGWE) from amaiyi argued that the name could not have originated for ( igbo-ere) because the Aro slave trading activity which they associated with the name was a too recent historical event to be associated with the very early history of igbere. elder ogwe kalu ogwe therefore dismissed this claim as an arrant imagination of great historical distortion. This is another fallacy in our study of igbere origin. There is no concrete evidence to show that the Aro or their allies made up of (OHAFIA, ABAM AND ABIRIBA) ever made any attempt to invade igbere for whatever purpose at all. The Aro were slave traders and not slave raiders. They were never involved in any slave raiding activity. They obtained slaves from communities engaged in inter-communal wars, and through the manipulation of the ( IBINAUKPABI). As pointed out by Mang Obasi, the Aro were not great race warriors and empire builders. They exploited their ibinaukpabi for their own benefit. They were deeply involved in the Trans-Atlantic slave trade, but definitely not in the trans-saharah slave trade conducted by the Arabs, which even preceded the Trans-Atlantic slave trade. The origin of igbere has nothing to do with Aro or Arab slave trade. 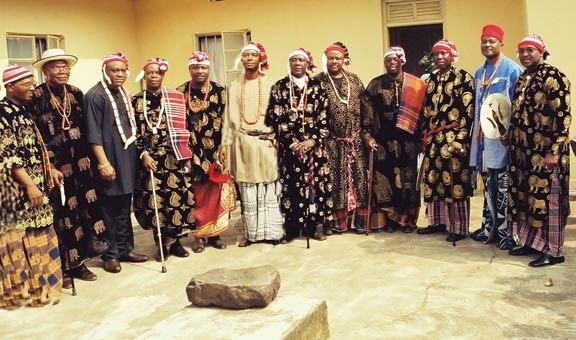 Having successfully defended their settlement and having denied igbo-ukwu access to their home, they proudly named the okai oronyi settlement (IGBO-ERU) this was because igbo ukwu never had access to their settlement, he was unable to penetrate their territory with the hope of subduing them. However, the name igbo-eru was not given to them by any outsider, or by any invader, rather they gave the name to their settlement, which later, metamorphosed into ( IGBERE). They left okai oronyi as igbo-eru people of the Ebiri tribe. They maintained the name in its new form of igbere to constantly remind them of their encounter with igbo-ukwu, and their past military valour and their invincibility. When igbere settled in their permanent site, they added Ebiri to igbere and called themselves ( IGBERE-EBIRI). This reminds them that they are the direct descendants of the famous Ebiri tribe. Their name was originally IGBOERU EBIRI. Some attempts have also been made to explain the origin of the name (EBIRI OKOMOKO). Elder, Ejie Eke Ukaegbu has claimed that Ebiri, the presumed son of okomoko was called Ebiri Okomoko, it was also to particularize him from other EBIRIS, or because his father founded okomoko. Okomoko is an igbo-speaking community of the south of owerri from where the Ebiri tribe migrated into okai oronyi, okomoko was the original home of the Ebiri tribe, the ancestors of the igbere people. The name Ebiri Okomoko reminds them of their ancestral home at okomoko, it reminds them of where they came from. Thus IGBERE EBIRI reminds them of their past military glory; IGBERE EBIRI also distinguishes them from other Ebiri sub-groups and the igbere located south of Abakaliki in Eboyi State Nigeria. 1. IGBERE ANCESTORS DID NOT MIGRATE FROM ANDONI. Cultural and geographical factors make the Andoni theory seem improbable. 2. NEITHER OKOMOKO NOR EBIRI REFERS TO ANY MYSTICAL OR HISTORICAL FIGURE. They refer to a community and tribe respectively and not to human beings. 3. THERE WAS NO SINGLE MOVEMENT INTO THE PRESENT IGBERE; rather there were waves of migrants of the EBIRI TRIBE, THE IGBO-ERU PEOPLE. 4. IGBERE HAS NO SINGLE ANCESTRAL FATHER; in one course the different groups that had established villages coalesced and started to co-exist as members of the EBIRI FAMILY, UMU-EBIRI. It was at this junction that some tried to invent a hierarchical order of seniority based on a very broad and vague sequence of event. 5. DEAR IGBEREANS, it is considered necessary to go into the history of igbere at such great length in order to achieve some level of balance and objectivity. This has to a large extent been achieved. There has been detailed and indepth analysis of both primary and secondary sources. It was on this basis that we came to the final conclusion. Igbere has a common origin, but not a common ancestral father. The problem of igbere history started since 1973, when some of these elders were not given us the accurate history of igbere, instead, they complicated the issue. This is the list of some of our elders who were interviewed in 1973. 1. Elder, Johnson Ezeikpe was interviewed about igbere history in his house in Amaukwu igbere on 20th july, 1973. 2. Elder, Ojukwu Igu was interviewed in his house in ibinaukwu igbere on 8th of july, 1973. 3. Elder,Uche Iheaka was interviewed in his house in ibinaukwu igbere on 8th of july, 1973. 4. Elder, Kalu Uko was interviewed in his house in Amaukwu igbere on 10th of july, 1973. 5. Elder, Kalu Ogbuji was interviewed in his house in Agbo igbere on 10th of july, 1973. 6. Elder, Igboko Udo was interviewed in his house in ibinaukwu igbere on 8th of july, 1973. 7. Elder, Madurudo Anyanwu was interviewed in his house in Agbo igbere on 10th of july, 1973. 8. Elder, Igwe Anaga was interviewed in his house at Amagbo, okafia igbere on 17th of july, 1973. Let me conclude this lecture by saying that he who does not know his root, where he came from, can hardly know who he is, and where he is going. History is the study of society in time perspective. A society that abandons its history is gone for good and slips into oblivion. It is the principal medium for the transmission of culture. I DEDICATE THIS WORK I DID ( typing & posting of IGBERE history/ origin ON FACEBOOK AND ON GOOGLE TO THE ROYAL FAMILY OF UMUIKPO, OKAFIA IGBERE. FROM ENGR, PRINCE NWACHUKWU C. JOSEPH (PRINCE KUNTA-KINTE) 08139320492. Rubbish, you know nothing about Igbere. Don`t write what you don`t know.